These Quakehold! 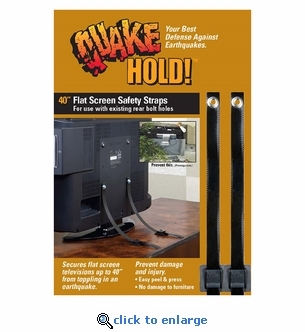 flat screen safety straps will protect your investment and keep the TV from falling and injuring children or adults. Each Quakehold Universal Flat-Screen TV Safety Strap kit includes two strong nylon straps, one end attaches to the back of the TV and the other end to your TV stand or wall using peel and press tape. The safety straps will secure up to a 40" TV and 100 lbs. Easy to assemble. Secures large flat screen TVs up to 40” and100 lbs.